Superb Enterprises Pvt. 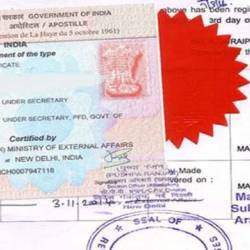 Ltd. is a direct outsource from MEA to render MEA Apostille Stamp services. We lend a hand to our clients in generating Birth Certificate Apostille, Marriage Certificate Apostille, Degree Certificate Apostille Attestation or any other Educational, Non-Educational and Commercial Document Apostille authentication. We extend our helping hands in Visa and Translation services also.